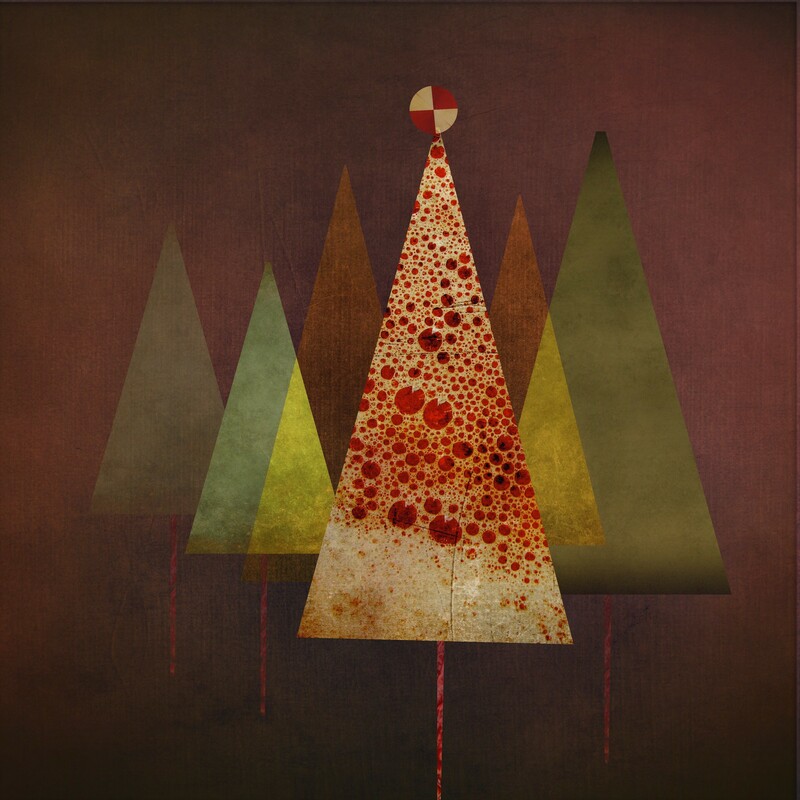 Red, Gold and green also follows in Clint Cline’s delightful triangular trees which began as a colour/transparency study; “Light from Darkness”. 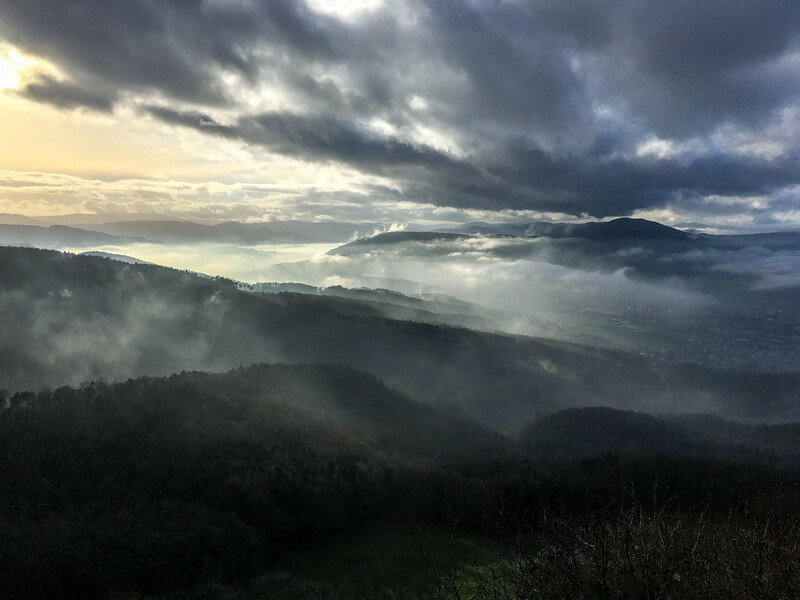 Enjoy the rest of our iPhone art and photography gallery with posts from the following fabulous artists and photographers and enjoy a great holiday break! More talented iPhone shooting and editing work that round up the group this week comes from the following iPC Flickr members: Tessfra, Clint Cline, ritacall, borisbschulz2009, Susan Detroy, Karen Axelrad, Tomaso Belloni (x2) Jean Hutter, lorenka campos, Mark Walton1(x2), Sid Pena, Fleur Schim, Bob Weil and Andreina Schoeberlein. By the way…if you’re looking to extend your iPhone art skills for next year how about trying this? 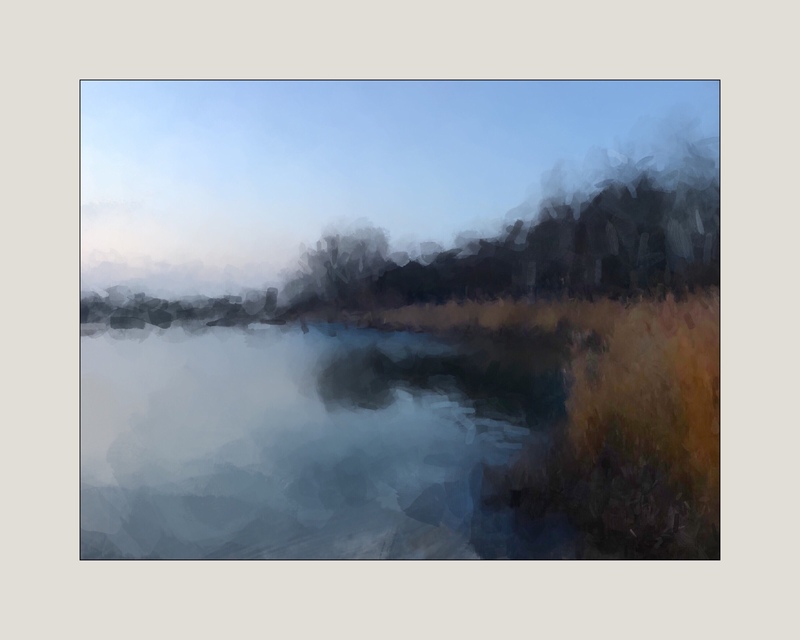 If you want to top up your iPhone art skills and challenge yourself over the holidays and into 2019, you might want to try the new course I co-created over the past year with multi-published author and talented photo artist: Susan Tuttle. It’s a brand new series of video tutorials, launched this month called iColoramaCreativePLUS and it’s currently HALF PRICE for just a few days more. Click here to take a look. Thank you all for submitting to iPC Flickr group! Have a fabulous holiday break! If you’d like a chance to be featured in this weekly showcase, please remember to include your apps and backstories with your photos. Thank you, as always for submitting your amazing work.- For a chance to feature, please join our Flickr group. Don’t forget to “ENABLE Photo SHARING” on your images in order to be featured. Instructions for this are on our iPC Group Rules page on the iPC. 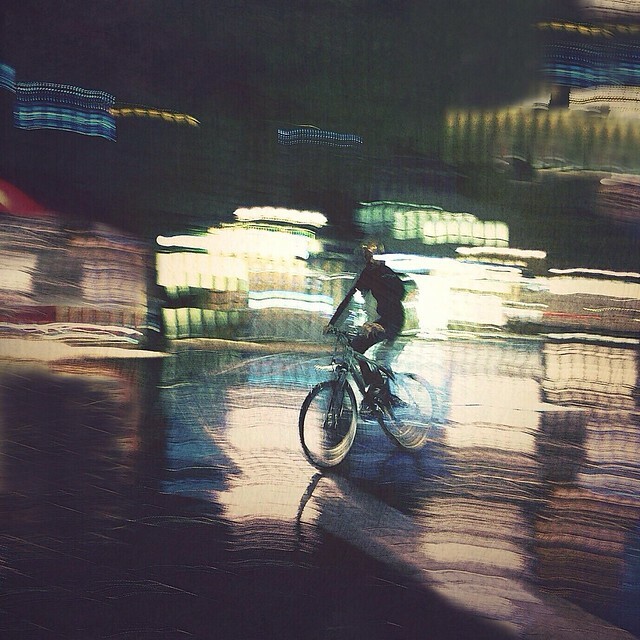 App used : Slow Shutter Cam Hipstamatic Leonardo snapseed. Backstory: This image began as a color/transparency study in my “Light from Darkness” study but quickly morphed into a Christmas motif. Apps used: IColorama for cropping, toning and blurring the background. Metabrush painting watercolor Wet for background and various brushes for couple including limited, texture 1 and 2, shatter and ground. IColorama for painting over background with paint/artist, high, vibrance. Also addition of sparkles and script. Snapseed for lensblur, vintage, some vignette and frame. Backstory: I was walking along a pathway in Boston Common on a weekend winter evening so it was crowded with visitors to the city. It was a beautiful evening with Christmas lighting on all the trees. I was with family so I had to act quickly with my iPhone to pick my shots. There were two couples actively engaged in a private wedding ceremony but apart from each other. There were people all around them, seemingly ignoring the importance of what was taking place, just walking by. These couples were in the middle of the path and people had to walk around them. When I got to the second couple my phone was ready and I took the shot. I love the gesture of their bodies, the look on his face and the way she seems to be reaching out to him but maybe a little embarrassed as she seems to be hiding behind her veil. I love the contrast of her billowy dress against the dark tones of the evening and the way the sparkling lights on the trees around them seem to add to their private celebration. I’m sure there must have been a special reason for them to exchange their vows in this way. This photograph has so many contrasts and will probably be one of my all time favorites. Apps used: Snapseed, PaintCan and Formulas. 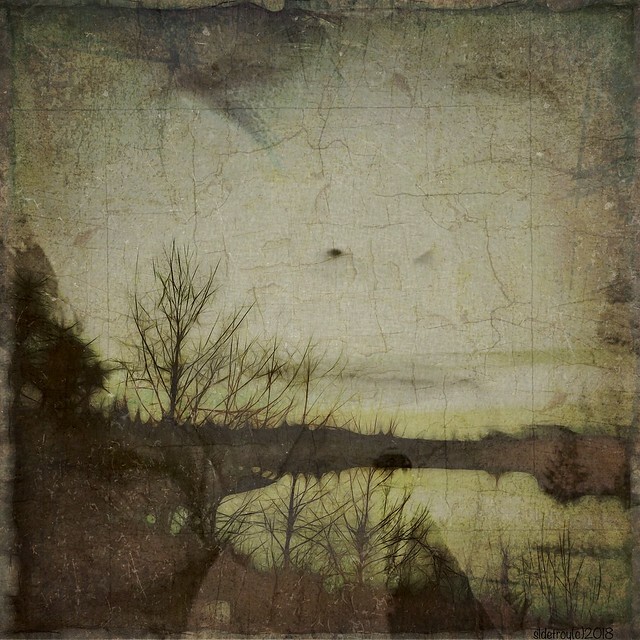 Backstory: For the past couple years I’ve been creating a series called “Portrait of a Woman.” The images are self portraits, blended and mixed with environmental elements- nature, trees, water, lakes, bridges, sunsets, pathways. For me the series is about female, power, aging, strength. The location is Golden Garden, Eugene,Oregon, one of my favorite places for walking, particularly at sunset. The group of ponds are in the city limits, a reclaimed an area connected to our urban waterway, leading to canal systems, reservoirs, rivers and to the ocean. For me the park and water have a feeling of healing and potentiality. My intention is my app driven art breaks through the cultural misconception of older women, proclaiming aging female in all her variations, how we are powerful, beautiful, vibrant, alive, deeply spiritual, active, smart, artistic to name just a few. We are the world in all her parts, flora, fauna, all the human makings. Backstory: The bottom line for this piece is a picture from two trees that thst I took with my phone in a department store here in South Florida. 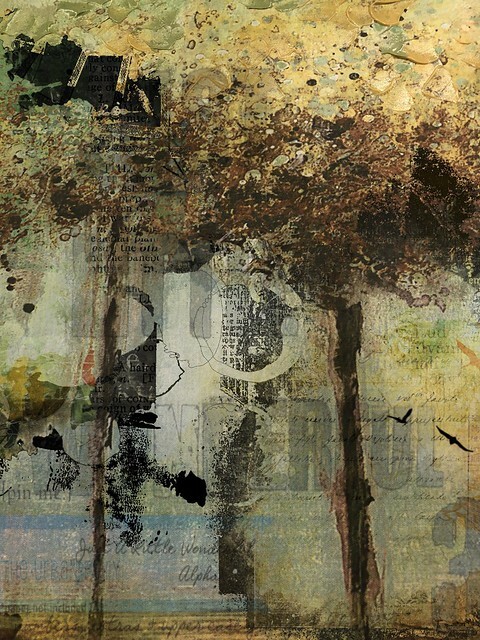 I love the painterly feeling of the piece and using just I coloroma I blended a couple of grunge textures from Tricia Dewey that I love to accentuate more the painterly feeling that I love from that pic. Finally I used distressedfx app to add more textures and a couple of birds. The inspiration for this piece was that living in South Florida we don’t have the beauty of changing seasons and picture took me to a lovely fall country side any place in the world. 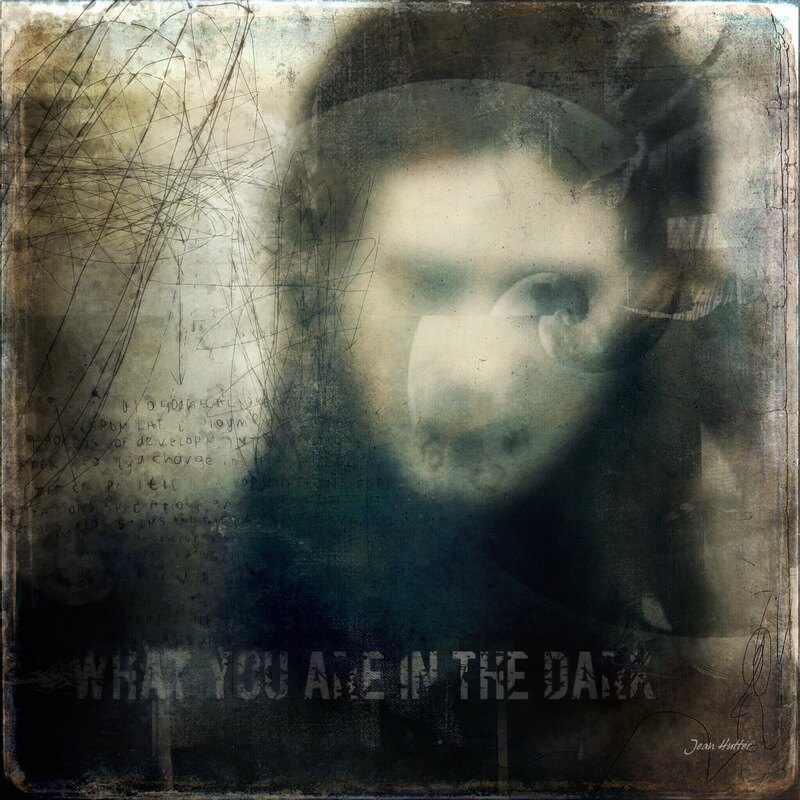 Backstory: I saw the text “What you are in the dark” and found it intriguing. We are all something different in the dark. I played around with a very blurry photo I had taken and added lots of “stuff” until I had a mysterious image.each Fall. 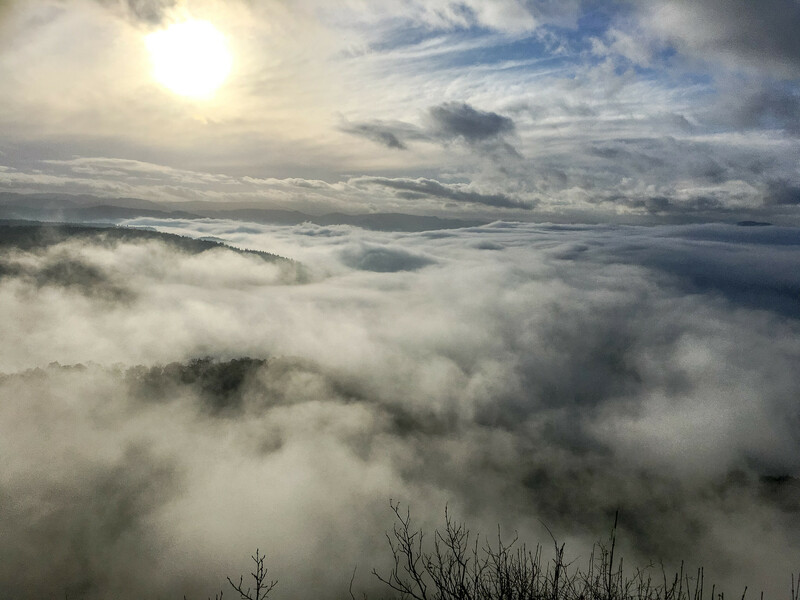 It’s a winding and hilly road, and as you come up one hill, this is the beauty you’ll find. I can hardly ever resist shooting it as I drive through. This particular shot was just taken out of the window of my vehicle. Living out in the country, it’s not usually a problem to come to a complete stop to get the shot you’re after! I’m always impressed at how far phone cameras have come. Backstory: This piece was a pretty spontaneous piece that started after talking to a friend about a cabaret series. I started thinking about carnival performers and dancers of the entertainment world and what it would be like to belong there. So, my imagination started twirling around, I started the project and this is what I came up with. 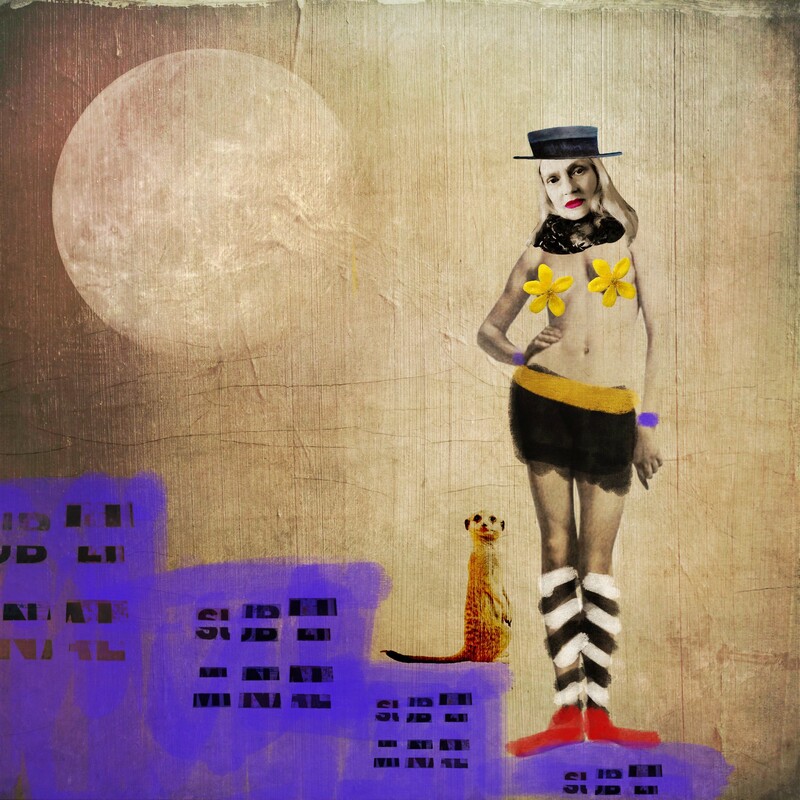 I started the piece with a texture from Stackables as the background and composed the figure in Superimpose with a self portrait worked in Remix and Freemix cutouts. I then painted clothes, shoes and the purple buildings in Procreate. I added the moon in Alien Sky. The title came from the Emerson, Lake and Palmer song Karn Evil 9…Welcome back my friends, to the show that never ends, we’re so glad you could attend, come inside, come inside! 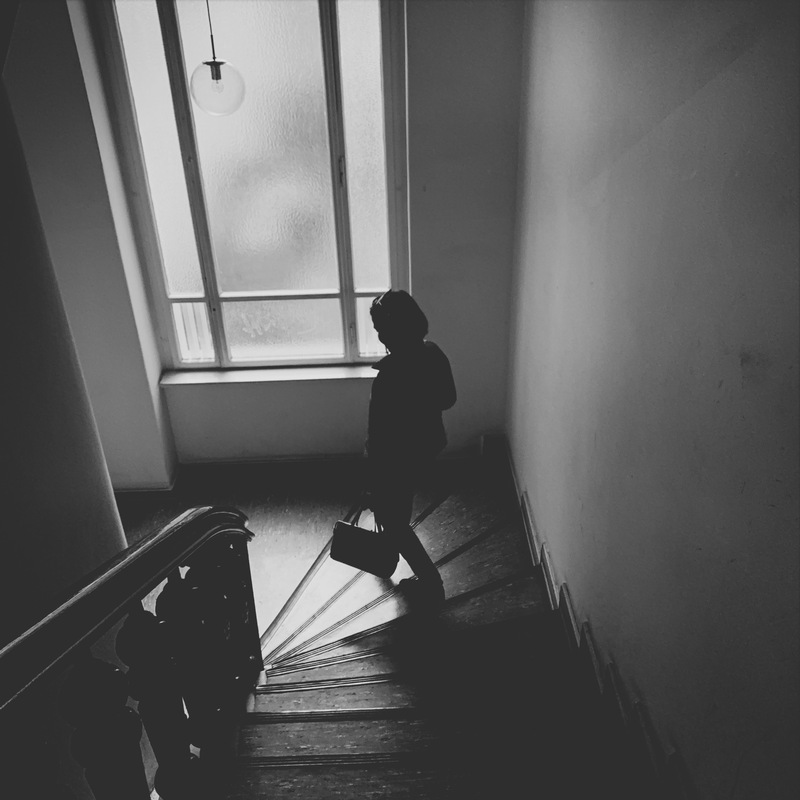 Apps used: Hipstamatic with Madalena lens and BlacKeysXF film. Backstory: This photo was taken with the iPhoneXS for my 365 day project using only Hipstamatic photos taken with the randomized shuffle effect straight out of the camera. I liked the window light silhouetting my friend as she walked downstairs and was glad the random shuffle resulted in a black and white photo. Apps used: I shot with the iPhone6 default camera app and edited in Snapseed. Backstory: This is an old photo from 2016. 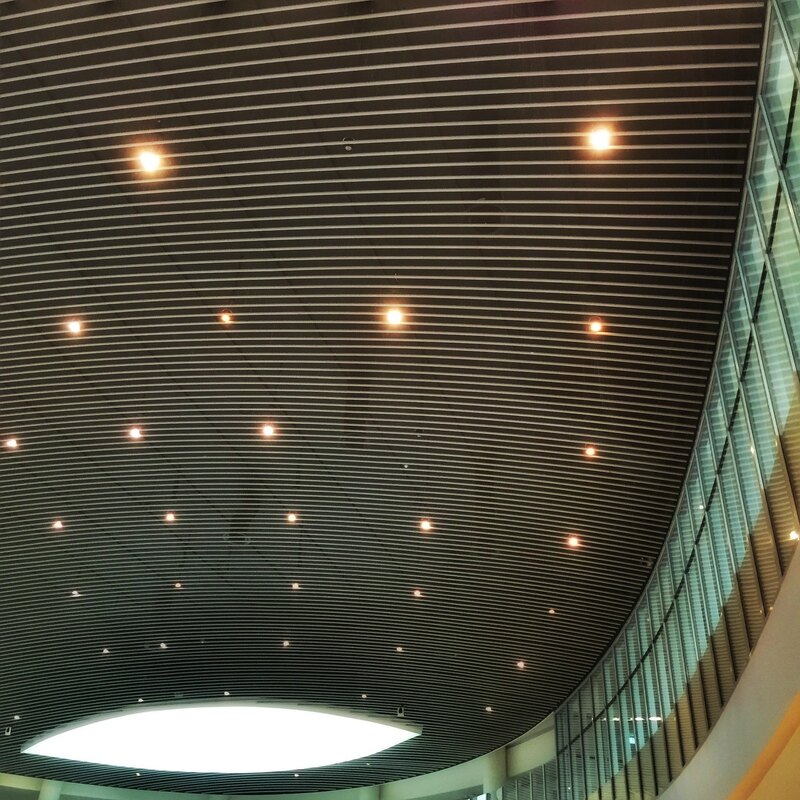 I was attracted by this ceiling of a large area inside the campus of NYU in Abu Dhabi, UAE. The entire campus is an amazing place, this particular composition has interesting curves although most of it is made of a pattern with some lights. To me it conveys a feeling of something missing. 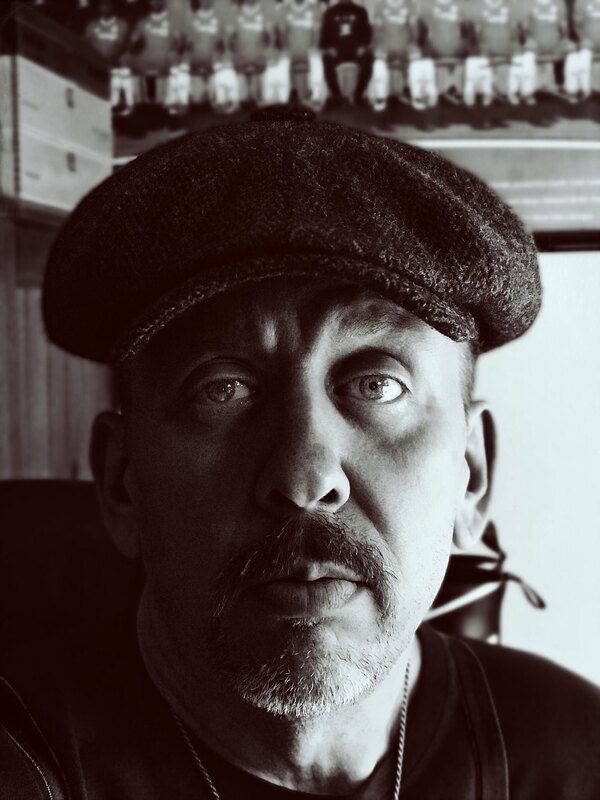 Apps used: Shot with an iPhone7 Plus using the TinType App. Apps used: This image was created on iPhone X , hipstamatic double exposure, then, Diana. Next I used iColorama for the black and white tone, and etch effect and finally, Snapseed. Backstory: I was in the Vatican museum and saw the scene with the man, off to the side, talking on his phone. thought it would be a good capture. The double expo was cool, enough. But, I decided to blend it in Diana with an image I took at Heathrow of an escalator and ceiling scene (also a flickr image). voila! Apps Used: Superimpose (for layering) and Snapseed (for retouching and conversion to a duotone) on my iPhone 6 Plus, and then Photoshop on the desktop to upsize the final image. Since it was a narrow, very busy lane on market day, I took three or four shots, and composited them together in Superimpose to ensure that the only person in the scene was the woman standing in the doorway. I then opened the final color image in Snapseed, and selected Drama > Drama 1 (to make my subject stand out from the doorway), then “Contrast” under Black & White (to further draw out the textures in the scene). I then chose Vignette, and adjusted the effect to -90. In Lens Blur, I enlarged the area of influence so that the outer line of the bull’s eye extended to the edge of the frame on left and right, and set the blur to +15. Finally, I went to Vintage and selected filter 11 with no adjustments. This is part of a collection of about 75 images, all of which I processed in the same way for consistency, varying the intensity of some effects to ensure a consistent look regardless of time of day. 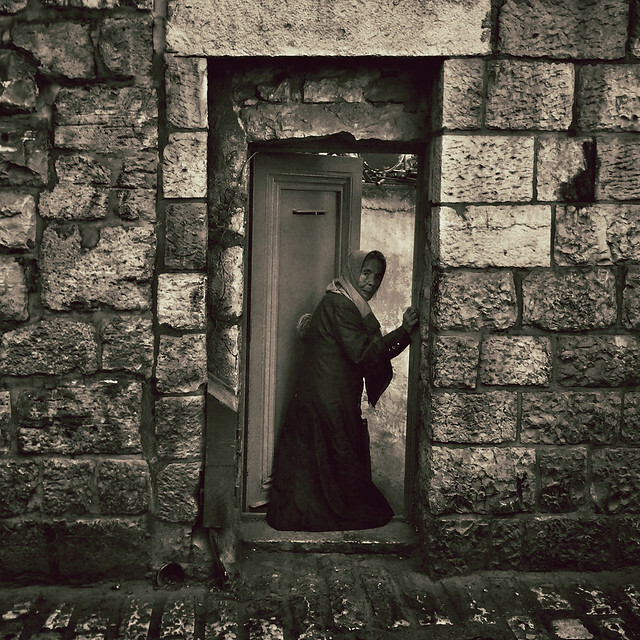 Backstory: It was a busy early morning entering the old city of Jerusalem on market day last month, and there was a large number of people streaming through this narrow alley when I spotted a woman moving in the opposite direction along the wall. She made for a very small, unmarked door, opened it, paused for a few moments, and then disappeared, closing the door behind her. While she did so, I fumbled to pull out my phone, and couldn’t seem to get it into burst mode, so I began snapping frames individually as quickly as I could. I captured maybe a half dozen with her lingering in the doorway, but in each shot there was someone else in the scene in front of her or along the wall. By layering multiple shots together (four total) I was able to completely eliminate everyone except the woman, keeping the shot of the center of the frame that seemed most intriguing. But because of my fumble with the camera, it took me several more moments than it should have to capture the necessary frames, and in retrospect, as I looked at the shots, I realized that the woman paused longer than she needed to in the doorway to let me get the shot. Sensing that she was not well-to-do, I wish I had approached her and offered her a little something, even if she declined in the end. It was really her willingness to let me capture her likeness that made the shot possible. Otherwise, this would have been the one that got away. But the group I was traveling with and the crowd swept me into the central part of the city, and I missed my opportunity to thank my gracious subject in some way. Stunning work presented here. Thanks for sharing my work.